Today, I released the second version of OpenShift Express Spring Roo Add-on. With this release add-on also support creation of domain namespace and changing the domain namespace. Now the only important thing left in the add-on is support for session management so that users does not have to enter email and password with every command. From today, I am starting a series of short blog posts which will cover the features of this add-on. In this post I will be talking about creating and changing domain namespace. Before I get into details lets me first tell you what is Spring Roo and OpenShift Express in case you don’t know about them. Note :You can also refer to my Spring Roo series on IBM DeveloperWorks for more details. OpenShift Express is a Platform as a Service offering from RedHat. OpenShift Express allows you to create and deploy applications to the cloud. The OpenShift Express client is a command line tool that allows you to manage your applications in the cloud. It is currently free and runs on Amazon EC2. Currently it supports Java, Ruby, PHP, Python run times. You can refer to OpenShift Express documentation for more details. OpenShift Express has three client tools for creating and deploying applications to cloud. These are RHC Ruby Gem., OpenShift Express Eclipse Plugin, and SeamForge RHC Plugin. I have mainly used RHC Ruby Gem and it is very easy to use and work. There were two problems why I decided to write Roo add-on. One is that you need Ruby Runtime and second is I use Spring Roo a lot so it allows me to perform full lifecycle of the application from within Roo shell. Because I am writing add-on I can also do lot of interesting stuff like session management, making some changes to the code to avoid repetitive work. One such thing that I have already added is adding OpenShift profile in the pom.xml. This will help me automate repetitive work. Getting started with the add-on is very easy. First you need to download Spring Roo and fire the Roo shell. Once inside the Roo shell we have to install the add-on. To do this execute the following command as shown below. It will take couple of seconds to install the add-on. You can view that a new OSGI process has started using osgi ps command. Before you can create domain please signup at https://openshift.redhat.com/app/express. The email and password with which you signup will be the credentials for accessing the cloud. After you have signed up the next step is to create a domain. You can’t create the applications before creating a domain. The domain is a logical name within which all your applications will reside. It forms the part of your application url. For example if you created a domain with name “paas” and application with name “openshift” your application url will be http://openshift-paas.rhcloud.com . We can create the domain using rhc-create-domain command but in this blog I will show you how to create using Spring Roo add-on. To create domain using Spring Roo execute the command shown below. It will create the ssh keys under user.home/.ssh folder if they does not exist. The passphrase is required for creating the sshkeys. If ssh keys already exists it loads the ssh keys from user.home/.ssh location and reuse them. finally it creates the domain with namespace openpaas. In case your credentials are wrong it will show a log line saying that credentials are wrong. Although you can’t delete a domain after you have created but you can change the domain name. To do that you can use the command shown below. This will change the domain name to xyz. Thats it for this blog. In the next blog we will look at how to create Spring JPA application using Spring Roo and deploy it to OpenShift Express. This entry was posted in cloud, spring and tagged openshift, spring-roo on January 16, 2012 by shekhargulati. I am writing a add-on for deploying Spring Roo applications to OpenShift Express cloud just like the Cloud Foundry Spring Roo add-on. The add-on is available at http://code.google.com/p/spring-roo-openshift-express-addon/. But I face problems when I release the add-on using Maven Release plugin (mvn release:prepare release:perform). So, this is simple guide to help me next time I face these issues. Adding Third Party Jars in an OSGI bundle. I have blogged this at https://whyjava.wordpress.com/2012/01/02/adding-third-party-jars-to-an-osgi-bundle/. The third problem I face is that svn client is not able to authenticate with Google Code. The exception that I get is shown below. To fix this I specify username and password with mvn release command as shown below. This entry was posted in java, spring and tagged add-on, spring-roo on January 15, 2012 by shekhargulati. I have been working with OpenShift express for quite some time and I create lot of applications and add different cartridge to the application. To access the cartridges using clients you need to remember the credentials. I developed a small application which was using MongoDB cartridge and I wanted to access the database using mongo shell client on the express instance but I forgot the password. To retrieve the lost password a simple recipe is to log into the express instance using ssh. Get the user information from rhc-user-info command. Once you log into instance just type env command. It will list down all the environment variable and from the list you can recover password. A sample output is shown below. This entry was posted in cloud and tagged openshift, recipe on January 15, 2012 by shekhargulati. This entry was posted in java, spring and tagged add-on, openshift, spring-roo on January 10, 2012 by shekhargulati. How Working Set Affects MongoDB Performance? Suppose you have 1 year’s worth of data. For simplicity, each month relates to 1GB of data giving 12GB in total, and to cover each month’s worth of data you have 1GB worth of indexes again totalling 12GB for the year. If you are always accessing the last 12 month’s worth of data, then your working set is: 12GB (data) + 12GB (indexes) = 24GB. However, if you actually only access the last 3 month’s worth of data, then your working set is: 3GB (data) + 3GB (indexes) = 6GB. From the example above if your machine has more than 6GB RAM then your application will perform great otherwise it will be slow. The important thing to know about working set is that MongoDB uses LRUstrategy to decide which documents are in RAM and you can’t tell MongoDB to keep a particular document or collection in RAM. Now that you know what is working set and how important it is let’s start the experiment. Dell Vostro Ubuntu 11.04 box with 4 GB RAM and 300 GB hard disk. Java 6 MongoDB 2.0.1 Spring MongoDB 1.0.0.M5 which internally uses MongoDB Java driver 2.6.5 version. The test case will run 6 times with 10k, 100k, 1 million,2 million, 3 million, and 10 million records. The document used is shown under document heading and is the same as the one used in first post just with one extra field index(a simple int field which just auto increments by one) . Before inserting the records index is created on index field and then records are inserted in batch of 100 records. Finally 30000 queries are performed on a selected part of the collection. The selection varies from 1% of the data in the collection to 100% of the collection. The queries were performed 3 times on the selected dataset to give MongoDB chance to put the selected dataset in RAM. The JUnit test case is shown below. In the table above number of records are in million and time to do 30k queries is in seconds. One thing that this data clearly shows is that if you have you have working set which can fit in RAM performance almost remains same agnostic of total number of documents in MongoDB. This can easily be seen by comparing 3 run of 1 % dataset of all dataset values. 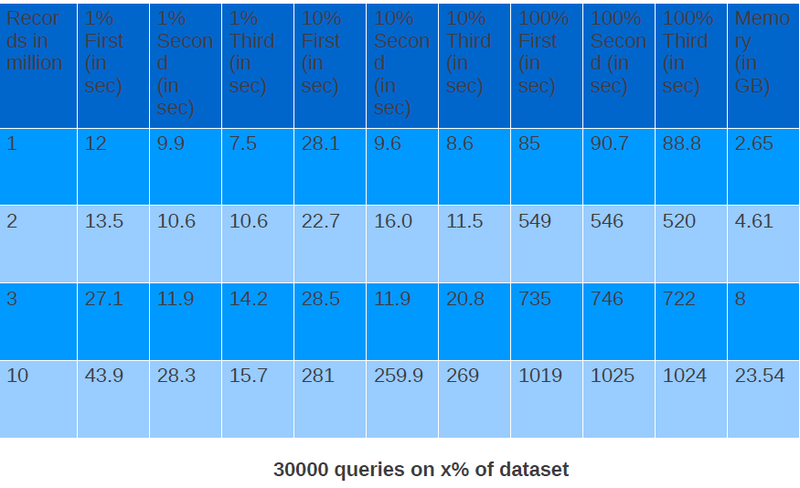 Performance of 30k queries on 1% of dataset on both 3 million records and 10 million records are very close. This entry was posted in nosql and tagged java, mongodb on January 10, 2012 by shekhargulati.